Bishop Peninsula in Delaware Bay Lagoon. Maori Pa Beach isthmus and Delaware Bay far left with coastal hills and distant Bryant Range beyond in mist. 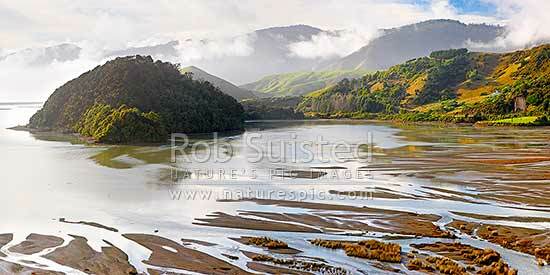 Panorama, Cable Bay, Nelson City District, Nelson Region, New Zealand (NZ), stock photo.